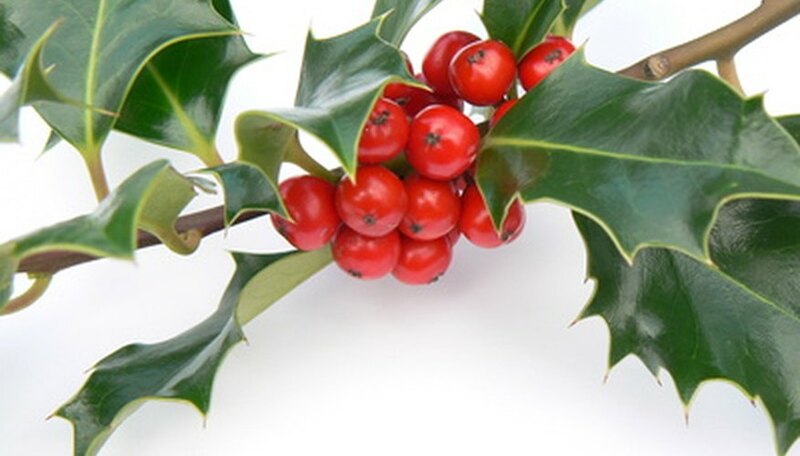 Holly shrubs belong to the genus Ilex, which includes more than 400 different species of deciduous and evergreen shrubs, trees and climbing plants. Known for their glossy, vibrant and often spiny green leaves, holly shrubs are typically evergreen--meaning they retain their vibrant foliage throughout the year. The flowers on holly shrubs are inconspicuous and usually emerge in spring or summer. Holly shrubs require moist, well-drained soil that is nutrient-rich. Carissa holly (Ilex cornuta "Carissa") is a variety of holly shrub with a slow growth rate and coarse texture. Carissa hollies grow 3 to 4 feet tall and 4 to 6 feet wide. The compact form is rounded to create a dense mound. As an evergreen shrub, Carissa holly retains its foliage all year long, helping provide a burst of greenery to a winter landscape. The leather-like foliage on Carissa holly is dark green and grows 2 to 3 inches long. Carissa holly is drought and heat tolerant, making for a hardy shrub. The shrub requires full sun to partial shade and can grow in a range of soil varieties. Plant Carissa holly in USDA zones 7 to 9. Dwarf yaupon holly (Ilex vomitoria "Nana") is an evergreen shrub with a moderate to vigorous growth rate. The shrubs grow 3 to 5 feet tall and 3 to 6 feet wide, with medium to fine texture. The dense, rounded form of dwarf yaupon holly shrubs holds tightly knit branches. The green to white flowers on dwarf yaupon holly are small and emerge in the spring. Dwarf yaupon holly shrubs have dark green leaves that grow up to 1 ½ inches long, with new growth emerging yellow to green. The shrubs are both drought and salt tolerant. Dwarf yaupons require full sun to partial shade and tolerate a wide range of soil conditions. Plant dwarf yaupon holly in USDA zones 7 to 10. Japanese holly (Ilex crenata) has a dense, mounded form, with a slow to moderate growth rate. The shrubs grow 4 to 10 feet tall and 3 to 5 feet wide. Japanese holly shrubs have small, green to white flowers that emerge in spring and dark green leaves that grow on the crowded stems. Growing ½ inch to over an inch long, the leaves retain their vibrant green color all year long, including in the winter when the landscape is often colorless. Japanese holly shrubs are drought tolerant. They require full sun to partial shade and well-drained soil that is acidic. Plant Japanese holly in USDA Zones 6 to 8.